The most attractive Thalictrum delavayi is a shade loving plant that requires a humus rich moist soil. This is a clump forming perennial with mauve to lilac flowers rising on tall wiry stems from early summer through to autumn depending on climate. The flowers are bell shaped and contrast well against the green foliage. Originally from China, Thalictrum delavayi is commonly called the Chinese meadow-rue and is regarded as one of the most attractive Thalictrum species. Regarded as a must for any shade garden it is a plant that will grow well with Astilbe, Trilliums, Corydalis and other woodland plants. Preparation of the soil is the key to growing this wonderful little woodland plant. Dig in good amounts of well rotted compost and some aged cow manure before planting. Ensure that the plant will receive good filtered light, however never hot direct sun except in the cooler climates. During active growth, water during dry periods and fertilise with a liquid seaweed fertiliser every few weeks. In winter, top dress with some extra compost, cow manure, vermicaste or leaf mould if available. You can propagate Thalictrum delavayi by division of established clumps during late winter, or from seed if you can find it. Soil – Well drained, moist and humus rich. Position – Shade to dapples shade. Flowers – Mauve to Lilac purple. Flowering time – Summer to late summer. Pruning – Cut back after the foliage dies back. 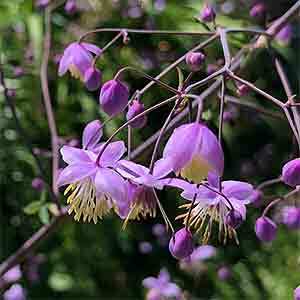 Thalictrum delavayi is available for sale from the following participating nurseries.